Agency theory has established that appropriate incentives can reconcile the diverging interests of the principal and the agent. Focusing on three applications, this dissertation evaluates the empirical relevance of these results when a third party interacts with the primary contract. The analyses provided rely on either laboratory or natural experiments. First, corruption is analyzed as a two-contract situation: a delegation contract between a Principal and an Agent and a corruption pact concluded between this Agent and a third player, called Briber. A survey of the recent microeconomic literature on corruption first highlights how corruption behavior results from the properties of those two agreements. We thereafter show that the Agent faces a conflict in reciprocities due to those two conflicting agreements. The resulting delegation effect, supported by observed behavior in our three-player experimental game, could account for the deterrence effect of wages on corruption. Second, health care is governed by contradictory objectives: patients are mainly concerned with the health provided, whereas containing health care costs is the primary goal of health care administrators. We provide further insights into the ability of incentives to balance these two competing objectives. In this matter, our theoretical and econometric analysis evaluates how a new mixed compensation scheme, introduced in Quebec in 1999 as an alternative to fee-for-services, has affected physicians’ practice patterns. Free switching is shown to be an essential feature of the reform, since it implements screening between physicians. Finally, the demand for underground work departs from the traditional Beckerian approach to illegal behavior, due to the dependence of benefits from illegality on competitors’ behavior. We set up a theoretical model in which the demand for underground work from all producers competing on the same output market is analyzed simultaneously. We first show that competition drastically undermines the individual benefits of tax evasion. At equilibrium, each firm nonetheless chooses evasion with a positive probability, strictly lower than one. This Bertrand curse could then account for the “tax evasion puzzle” i.e. the overprediction of evasion in models that ignore market interactions. We thereafter show that allowing firms to denounce competitors’ evasion is not likely to solve this curse—by providing a credible threat against price cuts, it fosters illegal work. Empirical evidence from a laboratory experiment confirms these predictions. 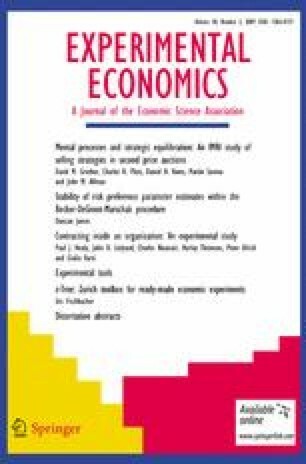 Without denunciation, experimental firms often choose evasion whereas evasion benefits are canceled out by competition. When introduced, denunciation is rarely used by firms, but the threat makes evasion profitable.